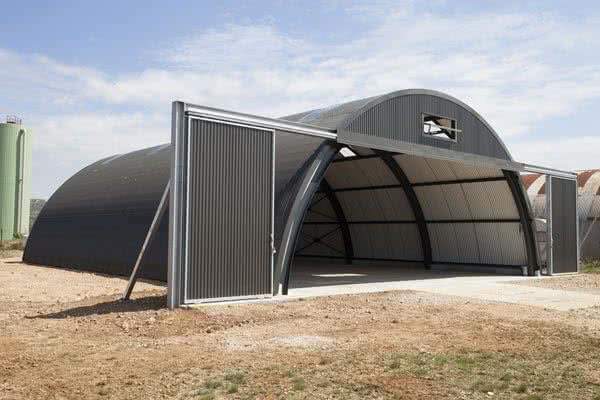 For generations, the Quonset Hut has been meeting the needs of the military, industrial giants and backyard hobbyists who need safe, dependable and economical storage space. Quonset buildings (AKA Arch buildings) deliver advantages that no other pre-engineered building offers, from low cost and high security to the ability to withstand blizzards, hurricanes – whatever Mother Nature sends their way. Even earthquakes, making a Quonset building the choice for business, industry, modern farms and families alike. These steel alloy, pre-engineered buildings combine decades-old design with the latest in high-tech features and ease of construction. Today’s Quonset building is based on decades of architectural refinement and the use of state-of-the-art materials to suit the needs of the most demanding consumer. Whether you need more storage at less than $7 a square foot or you want to retire to a secure, maintenance-free house that catches the eye, there’s a pre-built Quonset kit just right for your storage needs, be it for a garage, shop, barn or even a ‘Zombie Proof Mancave’! (we have, honestly, had a request for this). At BuildingsGuide we represent some of the best Quonset hut manufacturers in the United States & Canada. To receive four competing quotes for your new building simply complete our simple 3-minute form and receive prices directly from the manufacturer. All you have to do is then select the supplier who best fits your needs and budget. No obligation. No headaches. No hassles. cost – you don’t have to blow the budget out the back door to get the space you need. Over 75% of all Arch Building owners erect their own storage space. It’s that simple. Or, if you prefer, any knowledgeable contractor can erect your metal Quonset hut in a matter of days. Each building comes with a complete set of directions that can be followed by do-it-yourselfers or paid builders. 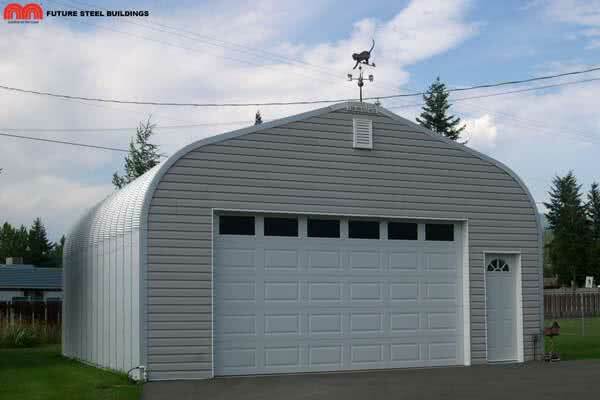 Typically, these pre-constructed metal building systems are bolted to a concrete slab, and concrete and steel make Quonsets strong enough to withstand tornado-force winds, driving rain and gusts of blown snow so you know your building will still be there when nature knocks loudly on the door. The roster of Quonset options is long, with detailed specs, so you know you’re getting the highest quality space for the lowest price. Quonset buildings are also considered “a green building option”. These building systems are manufactured using recycled steel, and can be recycled again for re-use down the road. Go green with your storage needs using the latest in Quonset technology (LEED compliant, too). Looking for secure storage space for garden and yard tools? Or, maybe you need to expand warehouse space to secure tons of excess inventory? From small backyard storage sheds to barn-sized structures large enough to house a stable of horses, there’s a Quonset hut that’s just your size. Width ranges from a comfortable 16 feet to an expansive 100 feet depending on just what width you need – even if you need space for the company jet. And length? Well, that’s up to you because a Quonset kit building is endlessly expandable to provide all the open space you need. No columns, no interior supports – just wide-open space for use any way you choose. 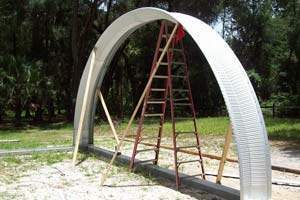 With a simple set of tools and a little time, you can erect your own Quonset structure, saving thousands of dollars in construction costs – and still be sure that your new storage space as lock-down tight and secure against intrusion from Mother Nature or unwanted visitors. Steel panels, two feet wide and 10 feet long, weigh only 40 pounds apiece, making assembly a snap. One sized bolt is used for all connections, simplifying the process even further. Each kit includes everything you need to erect your building, regardless of size or location. You don’t need any heavy equipment, making construction in small spaces simple and affordable. So, self-build or hire a local contractor to erect your new structure. Either way, you get more space for less money when you go with steel bolted to concrete. That building isn’t going anywhere under any conditions. As you can see for the image to the right, erecting your new building is simply a case of raising the 2′ panels one by one and then bolting these together. You will notice in the photo that this building is using a simple ‘Curb Style’ foundation, for more details on our building foundation page. Building and zoning codes vary from community to community so check with your local building inspector and zoning board to determine the requirements for erecting a Quonset hut on your property before you make a purchase. Typically, a Quonset sits on a floating 4” concrete slab, though your local building code may set different standards for your new building’s foundation. A thicker foundation will be required if heavy machinery and vehicles will be used inside the finished space. If you don’t require a solid floor then a pier foundation can be used. As far as zoning is concerned, Quonsets are attractive and can be customized to fit into any neighborhood, adding value to the property and to surrounding structures and businesses so obtaining zoning approval isn’t a problem. Quonsets can be insulated against the harshest winter weather. In fact, these metal structures are used by researchers in Antarctica! Whether you plan to use your Quonset hut to store materials or as a first or second home, the interior of your space remains warm and snug when insulation is added to interior walls. Covered with drywall or plywood the interior can be as finished as you need it to be. All insulation types can we used including; blanket and spray-on insulation being the most common. Typically, manufacturers recommend a minimum of R-13 for optimal efficiency. Living Space – Find that perfect parcel of land, lay down a concrete slab and erect your new building in a matter of days. Add dividers, a loft, balconies, windows, skylights – in a few weeks you’re living in the home of your dreams at a price that will honestly amaze you. See our Quonset Houses page for more details. A Backyard Get-Away – Maybe you need a separate office for your home-based business, no problem with the technology that goes into today’s pre-engineered buildings. Or maybe you need a retreat (AKA Man Cave) – a place to enjoy your hobby, from woodworking to ping-pong. 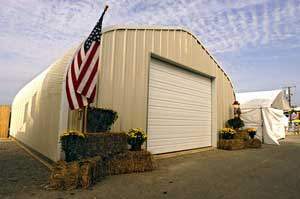 A small Quonset building is your space to enjoy any way you see fit. Additional Storage – Is your garage bursting at the seams? The attic stacked to the rafters? Is your basement a maze of boxes? Eliminate the clutter and get organized with additional storage space to store your house overflow neatly and safely. Yard and Garden Storage – Ideal for weekend warriors who take pride in their lawns and gardens. A small storage Quonset kit building keeps your mower and gardening gear out of the elements. You can even add a potting shed to get a head start on the growing season each year. Institutional Space – Crowded classrooms cut down on learning and traditional building methods add to the community tax burden. Add classroom space, new office space or other utility areas at one-third the cost of traditional stick-built space…and look good doing it. Warehouse Space – Quonset buildings are the ideal solution for growing businesses on a budget or a tight schedule. Double and even triple warehouse space at a price that makes your accountant smile. Your materials are close by, they’re secure and you still have operating capital to expand your customer base without expanding a limited budget. High vertical wall clearance provides more room for more goods and raw materials so you keep the business running smoothly and inventory safe and dry in any weather conditions. Vehicle Storage – Quonset storage buildings can handle anything: harvesters, cars, boats, huge RVs, trailers, heavy equipment and even airplanes and jets. Door sizes are adapted to fit your parking needs, making access to your vehicles as easy as walking out the back door. 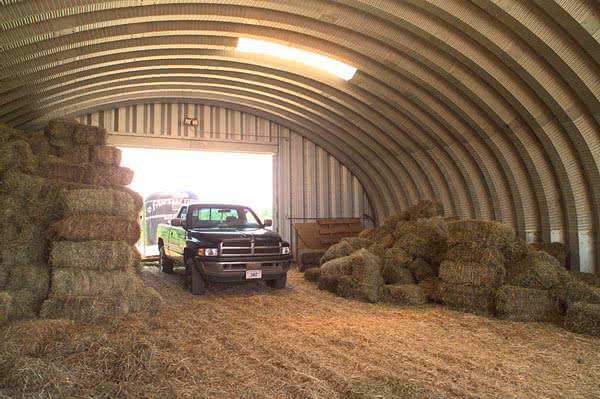 Farm Storage – Keep your livestock dry and your crops safe from harm any time of year. Agri-business discovered pre-manufactured metal building systems years ago and, today, farm owners use them to store everything from cows to combines to crops. Today they’re being produced and used for storage sheds, especially on farms and ranches; for garages, particularly for large vehicles; and workshops. They are ideal for storing and protecting grain, livestock, and all kinds of farm and ranch equipment. Because they are much stronger than I-beam buildings or pole barns and easily expandable to any length, they have been popular on farms and ranches for over forty years. In 1941, the U.S. Navy needed a versatile, multi-use building that was easy to ship and could be assembled without any special skills or tools. They were produced by The Fuller Construction Company near Quonset Point, Rhode Island for the navy. Originally, they were 16′ x 36′ with curved steel T-ribs. The floor was tongue and groove and its exterior was galvanized metal. At the time (World War II era) they became popular for both military and civilian uses and were originally known as ‘Nissen Huts’. They came to represent the postwar economic and demographic boom. Some are even listed on the National Register of Historic Places. Over the years, the original Quonset design has been modified but it still meets the initial goal of providing an all-purpose steel prefabricated building that can be shipped anywhere easily and be put together effortlessly. Why did they choose Quonset huts? These buildings provide advantages no other pre-engineered building can provide – low cost and high-security structures. 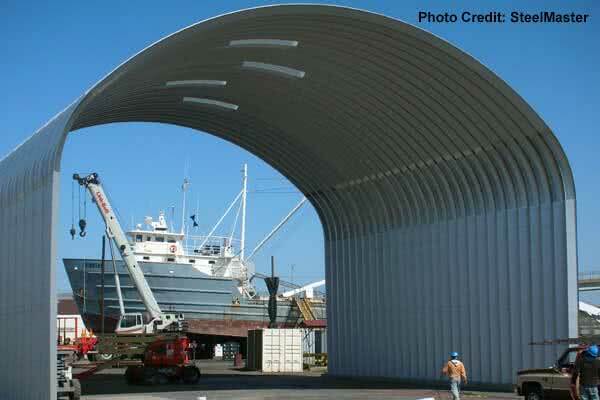 Drop us a line to discover the advantages of Quonset buildings, where low-cost meets high-tech. You’ll save thousands, you’ll cut down on maintenance and you’ll like the way they look and perform.